Cover of Feminist Thought by Rosemarie Tong (1989 edition). This entry was posted in Reading Books and tagged book review, books, feminism, feminist theory, nonfiction, women writers on 30/03/2016 by nissetje. This past Saturday, my friend R invited me out to her place to make stained glass mosaics. It’s something I’ve always wanted to try, and R’s work is beautiful, so I was very excited to have a chance to learn from her. This entry was posted in Everything, Making / Creating and tagged art, creating, creativity, friendship, learning, mosaic, stained glass on 28/03/2016 by nissetje. 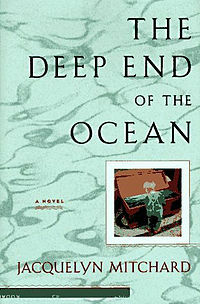 Cover of The Deep End of the Ocean by Jacquelyn Mitchard. This entry was posted in Everything, Reading Books and tagged Barking Back, book review, books, fiction, women writers on 16/03/2016 by nissetje. Cover of Belong to Me by Marisa de los Santos. This book was so gentle it was bland. Like plain potatoes. Kind of a disappointing chew. The story was told from the point of view of three characters, Piper, Cornelia, and Dev. Cornelia’s part is told from the first person perspective, and the others from the third person, which is actually a technique I tend to like. De los Santos even manages to write that first-person perspective in a distinctive voice, which is always fun. This entry was posted in Everything, Reading Books and tagged Barking Back, book review, books, fiction, women writers on 10/03/2016 by nissetje. February is finally over. I did nothing creative in February at all. After I was rear-ended in January, I stopped weaving (because my back hurt). And when the February dumps hit me, I even stopped doodling, which is a disaster for me, because a doodle a day keeps the crazy away. I was going through some of my pictures from January to try to get inspired for March, and I found a couple of reminders that yes, I do indeed do things. This entry was posted in Everything, Making / Creating and tagged art, artist, depression, doodles, drawing, handwoven, loom, making art, mental health, mural, weaving on 02/03/2016 by nissetje.